Duchess Kate: A Kiss for Prince Louis: Adorable Portraits of Louis & Charlotte Released! 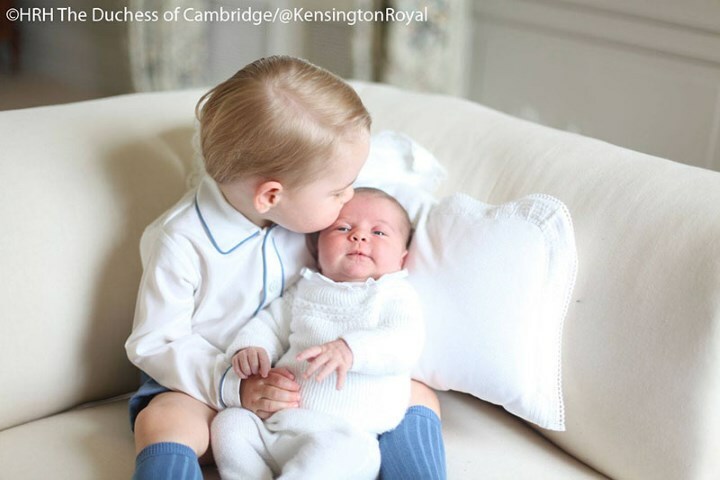 A Kiss for Prince Louis: Adorable Portraits of Louis & Charlotte Released! In an unexpected treat for royal fans the first official portraits of Prince Louis have been released by Kensington Palace in time for the Sunday papers. Even better, the photos include Charlotte. This image of big sister Charlotte, taken on her third birthday last Wednesday, giving the little Prince a kiss proved particularly popular. The Princess looks so grown up with her hair tied back! We weren't expecting the first portraits for several weeks yet. It's wonderful to see little Louis.The second of the two photos depicts the baby dressed in white, it was taken on 26 April, when he was three days old. I've always felt George very much resembles both Michael Middleton and Prince William, whereas Charlotte is more and more like the Queen every day. It's obviously very early to tell, but I think Louis resembles his mother. What do you think? As with the majority of photos of the Cambridge children, the Duchess took the images at Kensington Palace. During an engagement last year William revealed keen amateur photographer Kate takes photos of the children "every day". I'm sure she's amassed quite a collection and their personal family albums are bursting with snaps covering milestones and special days in George, Charlotte and now Louis' life. Both George's and Charlotte's first official portraits were released roughly a month after their births. George's were taken by Mike Middleton and Charlotte's were taken at Anmer Hall by Kate. The outfit Louis wore looks almost identical to Charlotte's below. Upon closer inspection, the top at least is definitely not the same although the leggings very well may be. Does Charlotte's sweater look familiar to you? 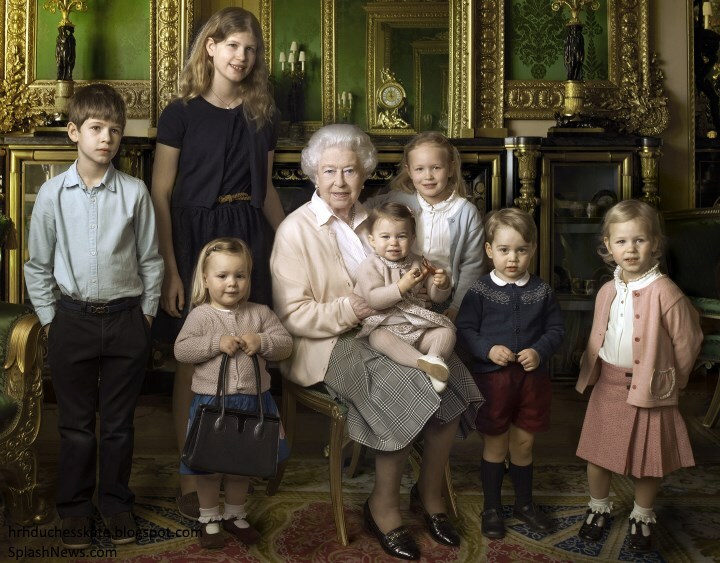 Laura immediately noted it's actually the same piece George wore for the Annie Leibovitz portrait taken of Her Majesty with her two youngest grandchildren and great-grandchildren to mark her 90th birthday. 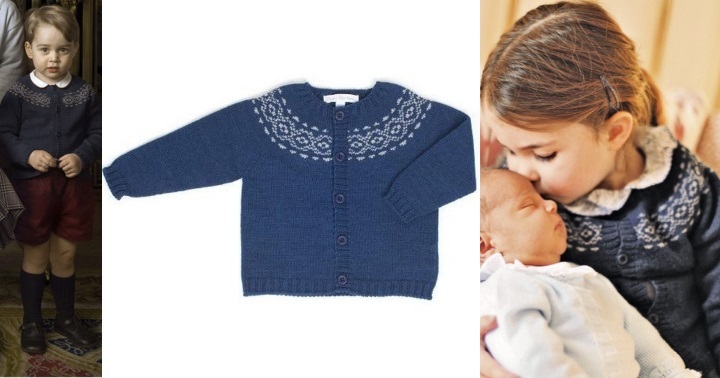 It is the £36 navy and white Fina Ejerique Wool Blend Knitted Cardigan. It's an exciting time for the royal family as a whole. In just two weeks, Prince Harry and Meghan Markle will marry at St George's Chapel. At a press briefing on Friday, Communications Secretary Jason Knauf confirmed Kate will be there whilst Prince William will be Best Man and it is very much expected George and Charlotte will take on the role of page boy and bridesmaid once again. Louis, who will be less than a month old, will not be going as expected. It was a lovely surprise to see the photos. I'm very much looking forward to seeing the first photo of all three Cambridge children together in the future. No doubt several were taken at Charlotte's birthday, but I think the photo of the Princess very much doubled up as a belated birthday photo in addition to being a sweet brother/sister shot. A portrait of George with Charlotte and Louis would be a smashing idea for his 5th birthday. In the meantime, both of these images are simply darling! Love this picture and I love we got a new picture of Charlotte also! For me it's a sunday-surprise: pictures of the wonderful little prince Louis full of dignity observing the world and of his big sister Charlotte full of love - Thank you, Kate and William! Thank you very much! Some of you saw them?! How?? So jealous. I think this are the photos we were waiting for, no? The one of Charlotte kissing Louis is adorable! Canˋt wait to see the other photos. So sweet! Louis looks like a wise old man :) He’s such a gorgeous baby! & Charlotte looks like the doting older sister ❤️ Thanks for sharing, Charlotte! Yay! They're released! So sweet :) I'm glad they decided to share these. I don't believe George or Charlotte had pictures released so soon after birth. Very nice of them to share their loves with us. I bet Charlotte is all about her new role as big sister and mum and dad's helper! Is prince Louis in the single photo wearing the same white outfit Charlotte wore on her first photos? To me it seems so. To me too. Very much so. 🌸 If you enlarge both the photo of Louis and then enlarge the photo of Princess Charlotte as a baby, the outfits are identical. That’s is exactly what I thought too, I’m sure it is. Such a lovely outfit. How cute!!! As an amateur photographer myself, children and animals are the hardest to photograph. I imagine it took awhile for the perfect shot and Kate got it. I also like to imagine that their home is covered in personal family photos or artwork from the kids. I hope we see a photo of the 3 children together, if nothing else - we’ll probably get a family photo when he is christened. Very sweet :) I also think he resembles Kate, but I insist to this day that Charlotte is a mini Carol Middleton!!! Louis is a beautiful baby. What a nice surprise. I never realized how much Charlotte does look like Carole. This picture is so precious! And little Louis looks like a "little Louis". The name fits. Yes, I think she looks like Carole too. She looks like the queen. I see 0% Carole Middleton. I said in the beginning Charlotte and George look like the Middleton side of the family. A close look at the 90th birthday photo-portrait, (which I absolutely adore and thank-you, Miss Charlotte!) with Princess Charlotte on HM's lap, will reveal how much she resembles the Queen. Carole does not have the Windsor (Queen Mary) close-set eyes or the squarish versus oval-shaped jaw--she even mimics the Queen's facial expression-- a reflection, I think, of what we now see as Charlotte's emerging personality. Charlotte has the same color of hair as Carole; that's about it. Also same as Catherine's. George has the wide square jaw like Michael, but it also resembles Charles Spencer's. The eyes are completely different. The only similarity I can see between Michael and George is the teeth and mouth. How I see it, anyway. I think some of us want them to look like the royal side of the family and others don't. Absolutely adorable. I’m sure the photos were published now because Harry’s wedding will be the main story when Louis turns one month old. Adorable photos! I agree, the little prince looks much older than a newborn. I hope he eats well and sleeps a good portion of the night. Princess Charlotte looks so grown up. While she does remind me of the Queen, her silhouette in the above photo has a look that reminds me of her mother. Prince George also reminds me of Michael Middleton. Charlotte is hugging her best birthday gift. Happy belated Birthday! Louis looks like he is looking beyond the horizon into the future; a wise looking baby. Was this photo of him really taken when he was three days old? He looks all grown and over several weeks young/old. He resembles Charlotte's baby photo. In the other photo, may be she sung for him for a nap. He is a cute and a gentlemanly baby. Excellent work Kate! I expect we’ll get a group photo either for George’s birthday or for the Christening. Ohhhhhh - just beautiful photos - thanks so much Charlotte! What precious photos. Thank you for this beautiful post. And, what a talented photographer Mama Kate is! Those children are adorable. Here’s when we in the US get an advantage- we get to see the photos while much of Britain is in bed already! I agree with you Charlotte, I’ve always thought George to be a combination of Michael Middleton and Prince William. Prince Louis is a beautiful baby. His coloring is wonderful and he is so alert. Big sister Charlotte looks fabulous with her hair tied back giving her new little brother some love. We are so lucky to be on the end of Kates wonderful eye in taking fabulous photos. I can't wait to see a photo of the five of them plus Lupo naturally. The Queen will now have to sit for another photo with adding her newest great grand to the picture. However, I do not think one will ever top the original. Absolutely, fabulous! Don't forget, Zara Phillips is due this summer too, so maybe at Balmoral this summer! Gan Gan will undoubtedly be in the christening pics also. I agree USA Granny! How could Mia with the purse ever be duplicated?! Fun to try though, and I'd eat it up as much as the first one! This is just way too cute! I am predicting Charlotte will grow up to be my favorite royal. I'm so happy we got to see a birthday photo after all, and 2 new pictures of Louis! I'm not sure who I think Louis resembles yet. I must be in the minority, but I don't really see the resemblance between Charlotte and the Queen. With George, it's more set in stone for me and he's consistently looks the most like William and Michael Middleton, but Charlotte is different each time for me. The resemblances I've seen in Charlotte are Carole Middleton, Kate, Eugenie, and the Queen Mother. Yes, maybe the face shape of the Queen Mother with the Queen’s more serious expressions. I think Louis may be wearing the same sweater as Charlotte in her pictures with George too. I agree. The white outfit looks the same. Prince Louis has a very regal expression! Maggie-Minneapolis, I think you are right!! Beautiful pictures. Love them and such a wonderful surprise to see them. These are adorable! I am so glad they released a pic of Louis, where we can really see him, not all bundled up in a car seat. And Charlotte! So sweet and precious. Good of Kate to get a pic now, while he’s new and special. Soon enough he will be taking her toys and driving Charlotte crazy as all little brothers tend to do! Personally, I love that her hair is back in a ponytail. It’s different than every other style we’ve seen and is less, fussy? or maybe formal? I like it. And I love that the kids totally wear hand me down clothes. Not in the ‘it’s a symbolic time we are evoking’ but in the ‘we have it, it fits, rewear it’. And maybe a cordoroy skirt and a blouse? Adorable, normal, and also shades of Gan Gan! Yes!!! I love the baby pictures! I knew there was a reason why they didn’t release a new pic of Charlotte for her birthday. They knew they were gonna release the beautiful snaps! I feel they released the images early (compared to George and Charlotte) to not upstage Harry & Meghan. That’s very sweet and considerate of Kate & William! Such a happy surprise. I may be mistaken, but I almost think Prince Louis might have a bit of red or strawberry blonde hair! What a lovely surprise! I guess they just wanted to wait for the Sunday papers. This was so thoughtful of Kate to share photos of little Prince Louis so quickly. He certainly does look older than 3 days old. Those rosy cheeks, is that a Spencer trait. How appropriate to have him in same outfit as Charlotte. He is adorable. And such a precious photo of Charlotte and her baby brother in similar pose as George with his baby sister. Thank you Kate and William. Just the sweetest little dolls, love them both, what little angels, such blessings. I imagine the joy these children have brought to the family and I bet Harry has the best time with them and James as well. Bless William because he sure has a jewel in Kate, she must be the best kind of mom. Thank you Both for sharing the photos, my husband even commented how cute Louis is and noted how he is holding his little arms and hands sort of stiff and straight down- which all newborns do at times, well it just takes us back to when our son’s were just babies they did the same thing and you just can’t get enough kisses in!! Yes, that's my opinion too: "Bless William because he sure has a jewel in Kate... Thank you Both for sharing the photos"! I adore William and Kate for their relationship. For me they are a dream team with wonderful team work. William and Kate, may God bless you and your wonderful kids! Ah... This is beautiful! Charlotte could you put the three sibling"s first photos face featured next to each other for us to compare? I think Louis and Charlotte"s first pictures do show resemblence... Not? I don't think I've ever seen a 3 day old baby. I had no idea they looked so alert. Louis looks adorable. Probably was responding to Mummy's voice. That obviously makes the pictures different than if they were taken by a professional photographer! I understood the picture of Louis was taken on April 26 and the one of Charlotte and Louis on May 2nd. Forgive me if I'm wrong. The photo of Louis alone was taken April 26, I believe. The picture of Louis alone was taken on April 26, and the picture with Charlotte was taken on May 2. I think Charlotte and Louis look like their dad and George is favors the Middletons and his Gan Gan. Well what a BEAUTIFUL surprise! Little Prince Louis sure is a beautiful baby. Love the sweet little brother/big sister moment caught so well on film by Kate! I am so glad they chose to share these shots with us! I will look forward to a pic of the three of them together! Very sweet and delighted they were released when they were - to honour Charlotte as well as the new one and before the wedding sweeps all before it. I can't say Charlotte looks like anyone (other than herself) in this photo - but she did make thing a bit of the queen the other day. But so much change comes. The baby reminds me a lot of little Adrienne in the photo released at the same age or so. I think that Charlotte's looks lean more Windsor – she looks like the female version (with some other minor differences, of course) of William. Prince George looks like Kate's dad. Prince Louis is Kate to the "T". I don't think that I have ever seen a newborn (3 days old) who looks so much like one of the parents. Louis has Kate's head shape, eyebrows, eyes (those eyes are undeniably Kate's), chubby cheeks (most evident in her university days), forehead and nose. Look at his profile (photo of Charlotte kissing him) and look at Kate at a young age. The semblance at such an earlier stage is staggering. Kate certainly is a great photographer! She always captures such beautiful snaps that look so candid yet so sweet and thoughtful. Love love love! We wore hand-me-downs as well and for the longest time, my cousins and I thought hand-me-down was the brand name. I love that she recycles clothes - at that age the grow so fast, it is very sensible to reuse. 🌸 “hand-me-downs” was a brand name. That’s funny, Alaina. :) And you are right they do grow out of their clothes so fast at that age it is silly not to reuse them. Thank you so much for this post. We were desiring new photos and here they are! 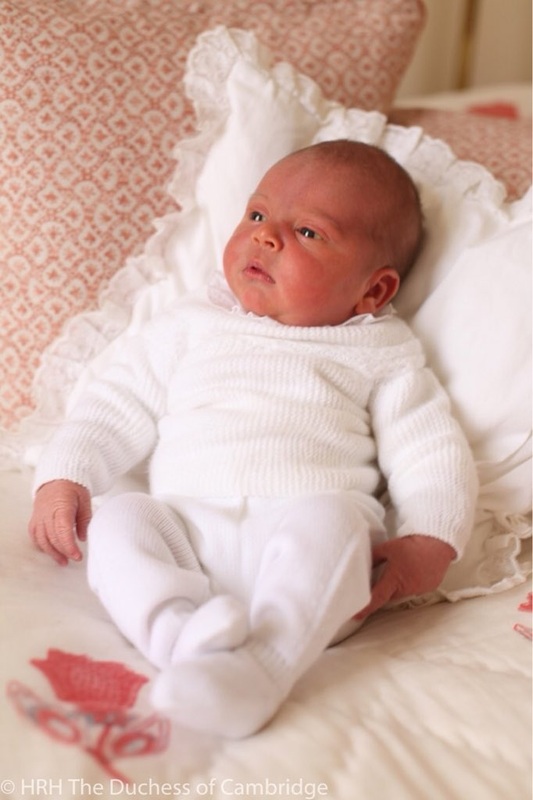 Prince Louis looks beautiful and he seems a one month old boy already. Princess Charlotte looks adorable as a wise older sister. I'm looking forward seeing her and Prince George at the wedding! Thank you again and sorry for my not correct language. Louis's white shirt and Charlotte's shirt on pic with George are similar. Yeah! and this small similarity gives a big connection between sister and brother. :) Very smart! Wonderful. Adorable ! Gentle kiss and a gentle hold (almost a stoke) on Louis's arm. Charlotte is a true little lady. And Louis seems so sweet and serious in his sleep. Photos is simply beautiful,amazing. Charlotte takes after her mom.Bravo for Kate -she took a perfect picture. Thank you Charlotte, what a lovely surprise it was, popping in here and seeing the post. What a lovely surprise and so appropriate to incorporate Charlotte's birthday and Prince Louis's birth together. This was a very new picture of Charlotte much better than some official birthday portrait which could well have been taken several weeks ago and Louis looked very alert for a 3 day old child it was good of Kate to share a photo of him so young he appeared to be a contented baby I agree with others who think these photos have been released now because of the forthcoming wedding but very much hope we may have photos of all three when George turns five and it would be nice if Kate releases more photos of the children during the year she takes such lovely photographs. I think Charlotte looks very much like the Queen - it's funny how such a strong resemblance can sometimes appear after a couple of generations. It's so strong because it's not only her face but also her expressions and the way she looks at people. I love it! I also see a strong resemblance to William and her hair is all Kate. George looks a lot like Kate and Michael Middleton with a tiny bit of William thrown in. As for Louis, I find it very hard to tell with a child that small, so I'll comment on that at a later point. The picture of Charlotte an Louis is simply adorable!! I'm looking forward to seeing a picture of all 3 children together. Adorable photo's! My first time commenting on this blog. I am a very big fan...always open this blog first thing in the morning. It is lovely to see how much thought goes into very photo released by William and Kate. Thank you Kate! It is most appreciated! So adorable, I love the way Kate dresses the children’s. I really like how Kate dresses Charlotte in a lot of blue and how she once dressed George in pink. What sweet pics. They have a lovely family. Very lovely photos of Princess Charlotte and Prince Louis. Thanks, Charlotte, and thanks to the Duchess of Cambridge for taking the pics. Positivley precious! She managed to capture such a sweet moment between the siblings—and that tenderness is much more beautiful than a formal portrait would have been. Wonderful treat for the Cambridges to share these pictures. Thank you Charlotte for all of your wonderful work in your posts. Beautiful children, great photos. I'm glad you think Princess Charlotte looks like GranGran. I have always thought that. The eyes, the chin area! I was out of the internet yesterday; what a lovely Sunday surprise!!! Thank you for this post, Charlotte! I'm so happy these photos have been released! Kate takes beautiful pictures of her children. Prince Louis is a lovely baby and the photo of him and Charlotte is just so cute!! It looks like passing on the "baton" from George to Charlotte 🙂. The picture breathes out love and gentleness. Looking forward to a picture of all 3 kids together! 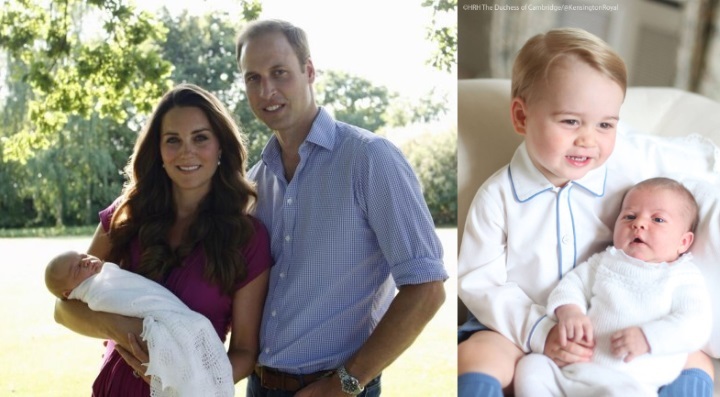 Lovely photos- thank you to William and Kate for sharing. I am sure we'll get a lovely family shot at little Louis's christening this summer. And I bet we'll see Miss Charlotte steal the show at Meghan and Harry's wedding. Can't wait. Charlotte, I very much see what you mean about him(Prince Louie) looking like Catherine! I think you can really seek it in his profile!!! What a sweet treat to get these photos! Wonderful children, adorable photos. This is very good to see them! Very cute photos, but I wish she had not used the fuzz filter on the one with Charlotte kissing Louis, I am just not a fan of that style of photos. But lovely that they released. I can not tell whom the kids look like. George to me is a mix, Charlotte most of the time looks like Lady Sarah Chatto and Louis is just too young to tell. 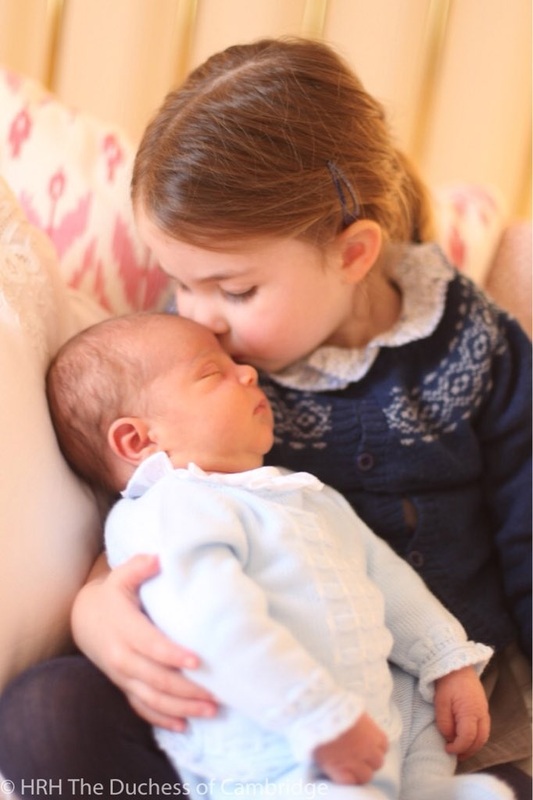 Lovely pictures of Prince Louie and Princess Charlotte. It looks like the little Prince is thriving and his sister Charlotte is giving him a big sisters care. Happy to see this. These first photos of all their children are all beautiful! Thanks for posting all of them in one place, Charlotte! I actually think Prince Louis looks like Prince William as a baby! I saw a photo of them, side by side, and they look very similar! I think Prince George and Princess Charlotte are both a good mix of both sides of their families. You can see the Middleton/Windsors in each of them, which I love! I love that they combined Princess Charlottes birthday photos with Prince Louis' first photos. That was well-done and released before it was too close their uncles wedding! Also, I love how they re-wear all of their clothes. Well done, Will & Kate! It makes them seem a touch more normal. I would love to win this necklace! 😍 My first (a princess) is due end of the month 🤰🏽 So exciting! Congratulations Chrystal! Best wishes to you and your little princess. Congratulations, Chrystal! Enjoy your new necklace and your little princess when she arrives. Chrystal, congratulations on winning the necklace and especially for your first who is arriving soon! Happy Mother’s Day to all our mothers in the US. And let’s include Kate, one of our favorite mothers, and also great grandmother the Queen! Great post! Thank you Charlotte.